Find the way to any Banana Republic Factory Store in the U.S. and enjoy shopping with discounts which reaching 70% from original retail prices (valid on selected styles). 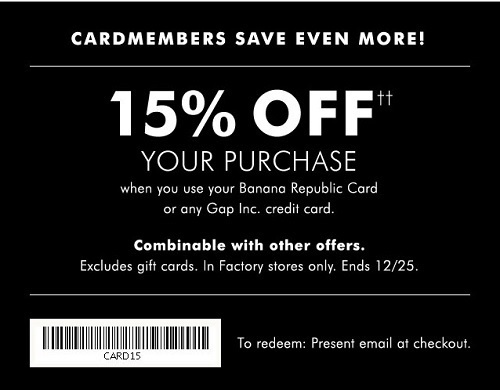 Plus, take an extra 15% off your purchase when you use your Banana Republic Card or any Gap Inc. credit card. To receive this offer present a special coupon at checkout. Source of the information is Banana Republic. The offer is valid until December 25, 2016. For more details visit any Banana Republic Factory Store Lcoation in the U.S.